Harry Reid seems to think Two and a Half Men has been canceled, because otherwise Charlie Sheen wouldn’t keep finding himself in weird spousal abuse tabloid catnip fiascos. Or maybe Harry Reid is just prone to saying really dumb things. Or was that really really dumb things? The top Democrat in the U.S. Senate apologized on Saturday for comments he made about Barack Obama’s race during the 2008 presidential bid. “I deeply regret using such a poor choice of words. I sincerely apologize for offending any and all Americans, especially African-Americans for my improper comments,” Reid said in a statement released after the excerpts were reported on the Web site of The Atlantic. What does that mean? “I deeply regret using such a poor choice of words.” There’s really no way to sugar coat what he was saying, but since he votes the “right” way for the mainstream media he lives to see another day; if he had an ‘R’ next to his name he’d be run out of town. Or maybe I’m the one with mental problems because I’m trying to psychoanalyze the guy who will forever be known as America’s capitulation rodeo clown. Sure, liberal historians are probably already trying to figure out how to spin his electoral death wish, – and perhaps they’ll succeed – but it doesn’t matter. There’s no coming back from surrender. While George Bush was fighting to survive (God bless you, JCVD), Harry Reid was playing Surrender Snarf talking about war wounds. And isn’t that always the case? 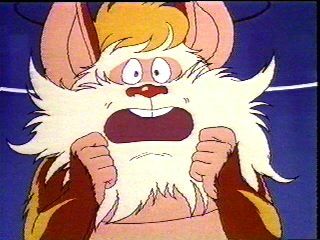 In a world where Democrats and Republicans are all good guys, we’re all Thundercats in this big bad Iranian mullah nut, nuke desiring, Mumra of a world, why do Democrats always opt to identify themselves as SNARF?